For those who don’t support Watford the legend and cult following that surrounds Lloyd Doyley may be hard to understand. A product of Watford’s under-appreciated academy which has produced the likes of Ashley Young, Luther Blissett and John Barnes, through thick and mainly thin as a Watford player Doyley has now been a first team regular for over a decade. He is one of only a number of players in the modern era of football to be able to boast the title of ‘a one club man’. ‘Lloydinho’ was an ever-present when Watford gained promotion via the Championship Play-Off Final at the Millenium Stadium. He was also a mainstay when Aidy Boothroyd took the Hornets to the dizzying heights of 20th in the Premiership in 05/06, alongside an FA Cup Semi-Final defeat to Manchester United. Despite this, Boothroyd’s greatest achievement to this day remains calling Doyley ‘the Black Zidane’ – nothing could be further from the truth, yet it encapsulates the admiration and respect that Doyley commands and deserves. The point is, when others left for pastures new (Ben Foster, Marlon King, Darius Henderson, Ashley Young, Danny Shittu, Jay DeMerit… the list is honestly endless) Doyley stayed to play for the club he loves. Whether this was by choice is another matter. In the entire history of transfer gossip and deadlines Lloyd Doyley’s name just does not appear, quite simply because no one else wants him. That may be harsh, but at the same time Watford would not let him go. 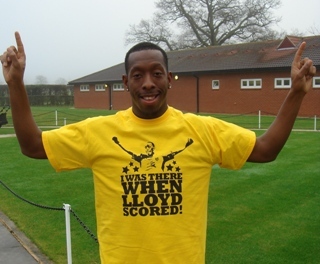 To date, Lloyd Doyley has played 385 times for Watford, scoring only twice. The first was a diving header against QPR 8 years into his professional career, the second came at the start of this season as an attempted cross floated over Adam Bogdan’s head, Doyley had the cheek to claim he meant it. Whilst an England call up is looking unlikely due to the strength in depth of English right-backs, his international career is not completely over as the Jamaican FA have been said to be monitoring his progress. A Doyley/Sterling duo down Jamaica’s right wing would be a force to be reckoned with. The likelihood of this becoming a reality seems somewhat far-fetched. Doyley still cannot be trusted with the captain’s armband at Watford, as he is never far away from an absolute howler (‘A Doyley’ for those in the Rookery Stand) – in fact no one has perfected the sliced clearance straight out of play or the short back-pass quite like LD. This is why Lloyd Doyley is a modern footballing legend, and more aptly, miracle. 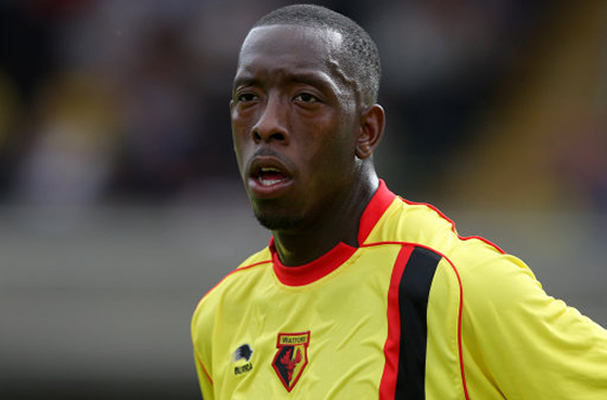 Ponderous, complacent but hard-working and lovable Lloyd Doyley is my Obscure Footballer of the Week. As a personal aside, at the start of this year I tried to set up a 6-a-side team. I called it FC Lloyd Doyley. The man himself was more than obliging in retweeting the only 2 games we ever played, losing 7-1, and 5-0. I can only feel there is some sort of poetry there. This entry was posted in Obscure footballer of the week and tagged aidy boothroyd, ashley young, championship, hornets, jamaica, lloyd doyley, marlon king, obscure footballer of the week, vicarage road, watford by Joe Bookbinder. Bookmark the permalink. Having realized from an early age he would never make it as a footballer, Joe Bookbinder tried his hand at management (Football Manager 2010) with mixed results - having restored Watford to Premier League status, Bayern Munich came calling, however the move was a step too far, too quick and he parted company after just 6 months. Joe has now taken up Sports Journalism, born and bred in London he naturally supports Manchester United, although in his attempt to support a 'local team' has developed a soft spot for Watford. I know this is meant to be an affectionate tribute, but I can’t let you get away with calling Lloyd ‘complacent’. A string of managers have testified to his unswerving dedication to improving his game, and whenever a manager has been foolish enough to drop him, he’s worked so hard in training that they’ve had to reinstate him within a week or two. Indeed, I can’t think of a footballer who has improved so much over a period of time – he wouldn’t have managed to keep the talented Lee Hodson out of the team for so long if he hadn’t. I know we love to laugh at the sliced clearances and poor passes, but they’re much less frequent than they used to be. Watching Lloyd fit into Zola’s system this season has been a joy. The manager is no fool, and he wouldn’t play him in that role if he didn’t trust him absolutely. Hi Tim, I think you make a very valid point, unquestionably Lloyd Doyley has improved over the years, had he not he would have been moved along some time ago. I accept every player has an off day from time to time, I was thinking of Doyley’s poor pass against Leeds that led to the award of their penalty. I completely agree with you about Doyley’s form keeping Lee Hodson out of the team. Doyley’s hard work, commitment and loyalty are very admirable and not recognised enough. As a Jamaican I am eagerly awaiting to see how well he will fare for us in our World Cup Qualifier against Panama. Hope we’ll get him in form.